17 June/July 2018 unmanned systems inside dium twin-turbine helicopter produced by Russia that is typically used for these inspections, has a wind limit of about 18 miles per hour. The team also had to rely on batteries during the in- spection, which were of course affected by the Arctic temperatures, Reichert said. The drone, the base station, the control panel, the camera and the external screen were all powered by battery. The cold batteries reduced the drone's f light time from 40 minutes to 20, with the pre-check f light time taking a minimum of 10 minutes. Another option involved using cables, but that combined with the cold led to the loss of gimbal stabilization. With only seven or eight visible satellites, limited GPS signals also made it difficult to f ly, Reichert said. This meant the system had to be operated in full manual mode, which, while safer than other methods used to complete these inspections, comes with its own risks. The magne- tometer was switched off to eliminate malfunctions. Thermal analysis was the priority during the inspection, Reichert said, but the team couldn't fly a standard thermal camera because of the big differences in high and low tem- peratures. 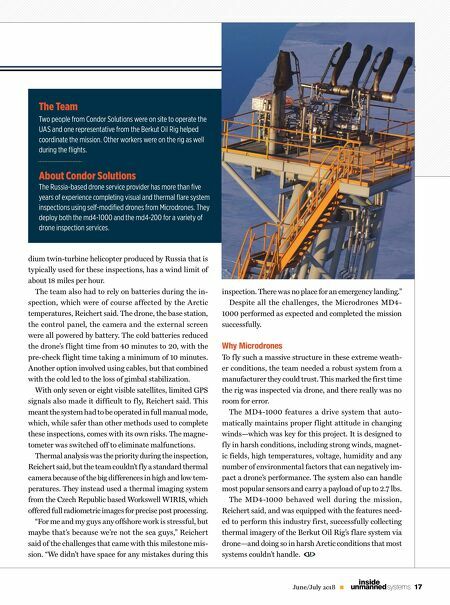 They instead used a thermal imaging system from the Czech Republic based Workswell WIRIS, which offered full radiometric images for precise post processing. "For me and my guys any offshore work is stressful, but maybe that's because we're not the sea guys," Reichert said of the challenges that came with this milestone mis- sion. "We didn't have space for any mistakes during this inspection. There was no place for an emergency landing." Despite all the challenges, the Microdrones MD4- 1000 performed as expected and completed the mission successfully. Why Microdrones To f ly such a massive structure in these extreme weath- er conditions, the team needed a robust system from a manufacturer they could trust. This marked the first time the rig was inspected via drone, and there really was no room for error. The MD4-1000 features a drive system that auto- matically maintains proper f light attitude in changing winds—which was key for this project. It is designed to f ly in harsh conditions, including strong winds, magnet- ic fields, high temperatures, voltage, humidity and any number of environmental factors that can negatively im- pact a drone's performance. The system also can handle most popular sensors and carry a payload of up to 2.7 lbs. 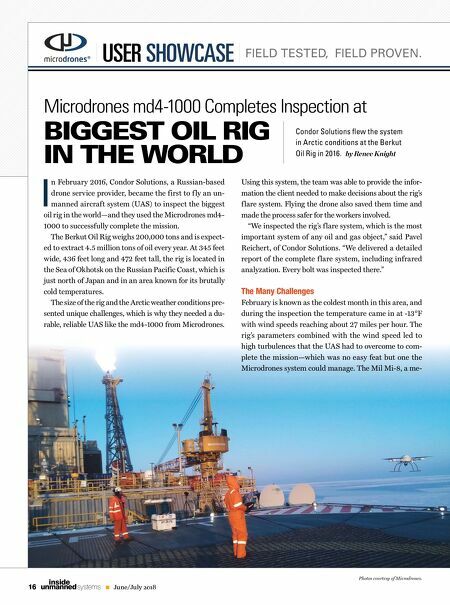 The MD4-1000 behaved well during the mission, Reichert said, and was equipped with the features need- ed to perform this industry first, successfully collecting thermal imagery of the Berkut Oil Rig's f lare system via drone—and doing so in harsh Arctic conditions that most systems couldn't handle. The Team Two people from Condor Solutions were on site to operate the UAS and one representative from the Berkut Oil Rig helped coordinate the mission. Other workers were on the rig as well during the flights. About Condor Solutions The Russia-based drone service provider has more than five years of experience completing visual and thermal flare system inspections using self-modified drones from Microdrones. They deploy both the md4-1000 and the md4-200 for a variety of drone inspection services.